Open one package of cookie dough, add a bit of red gel food coloring to the dough. I found that it’s easiest to mix the coloring in with your hands, kneading it gently, like bread dough. Add the food coloring a little at a time, until you have a vibrant red dough. Split each of the colors into three equal parts. Layer in alternating fashion, placing into a plastic wrap lined loaf pan, and patting each layer out until the dough evenly fills the the pan. Top with another layer, again patting until even. Repeat with remaining dough. Cover tightly and freeze for four hours or overnight. Immediately after the cookies are removed from the oven, use the star cookie cutter to cut the cookie shapes. You will need two side pieces, and one middle for each. Cut a round out of the center of 1/3 of the cookies. Try to work quickly, as the cookies set up very quickly and will be difficult to cut as they cool. Also, I used a tiny cookie cutter to make adorable little stars from the scraps. Once you’ve cut all the shapes, allow the cookies to cook on the baking sheet before moving. Place the middle cookie on top of the frosting glue and add about a teaspoon of mini M&Ms to the open center. Put another outline of frosting glue on the middle cookie and place another star cookie on top (so that top side side is facing out). Let the cookies harden for at least 30 minutes before serving. Since the warm weather is finally here, alot of people are having Birthday parties. A Pinata is almost always a must at a child birthday party. But they are so expensive! The big ones cost up to $40 these days!!! The cheapest pinata I was able to find last month was a small butterfly that was on sale for $11.99. My daughters just turned 5 and 6 so we had them a combined birthday party. 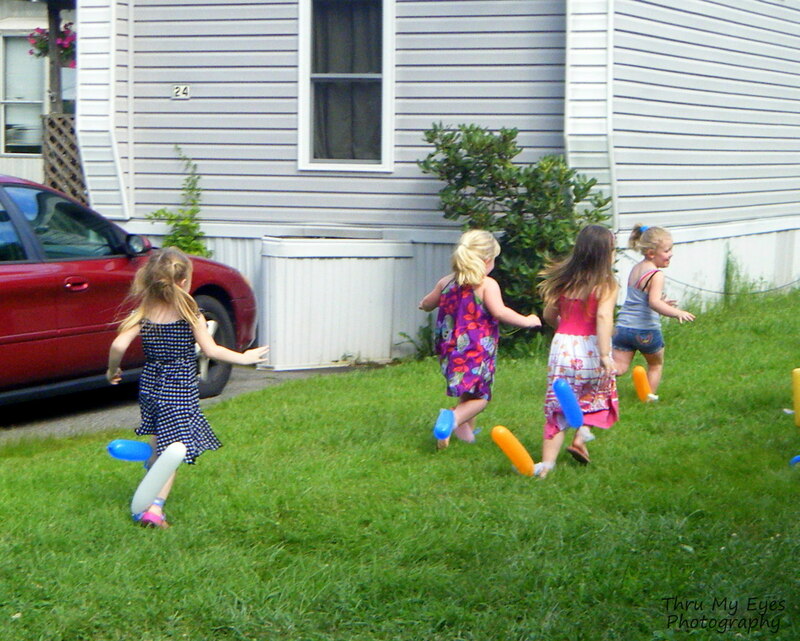 I ended up not being able to get them a pinata, we ran out of money at the end. The day before the party, my aunt came and got my girls so they could play with her daughter and I could finish up the house and finish getting ready for the Birthday Party. While she had the girls, she found directions to make a quick pinata out of paper bags! Yes, I know, that sounds lame, but it turned out really cute! Streamer in the colors that fit your Party Theme. Depending on how strong you want the pinata to be is how many bags you use. I used 2 and it lasted thru 5 little girls hitting it, but as soon as the first boy took a swing it busted and everyone was happy! So if you have a party full of boys you might want to use 3 or 4 bags. Bringing the Birthday boy or girl in to help with their pinata makes it even more special to them, along with the important bonding time you will be getting with your child! It's such a fun way to bring out someones imagination and make it useful! Start out with one bag laying flat on the table. Decide how you're going to decorate your pinata.You can use pretty much anything you like. Any theme can be displayed on the pinata. For example, my daughters' had a very gurlie party. Everything pink, purple and flowery with Princesses and Faeries everywhere! With our pinata, I drew and cut out flowers of pink and purple construction paper along with a few green leaves and a couple butterflies. My daughters and I randomly glued them on the front and back of the bag. You can find pictures of princesses or any special design online or draw and color your own, Magazine pictures make pretty pinata's also! Make sure that none of the important pictures or designs that you want visible are on the bottom 4 inches of the bag. Once you have your design on the bag and it is almost dry, if not all the way dry (depending on how much time you have before the party), Cut the streamer in 12 to 14 inch strips. You can distinguish how many of each color you would like to use, I did mine in a pattern with pink and white. Glue the strips about 4 inches from the bottom, letting them dangle past the bottom of the bag. You will need to open up the bag for this step. Make sure the strips are touching and go around all four sides of the bag, the last one may over lap a bit. Open up the other bags and place them inside the decorated bag. (They should all fit perfectly inside each other) Add your pinata goodies!! When you have all your goodies in your pinata, close the top of the bag by putting the tops together and using tape to keep it secure. Go around the top of the bag a couple times with the take to make sure it's strong enough to hold the weight of the bag on the string or ribbon. After you get it taped, using a hole punch, place holes about 2 inches apart across the top of the bag, about an inch from the top edge. Weave the string or ribbon thru the holes leaving about a foot of string on each end. Tie the ends together to make a handle on top of the pinata. This pinata can be made the day of the party and be drying while the party goers are eating and doing gifts, or it can be made in the days before the party. Finally...... hang up your Pinata!! 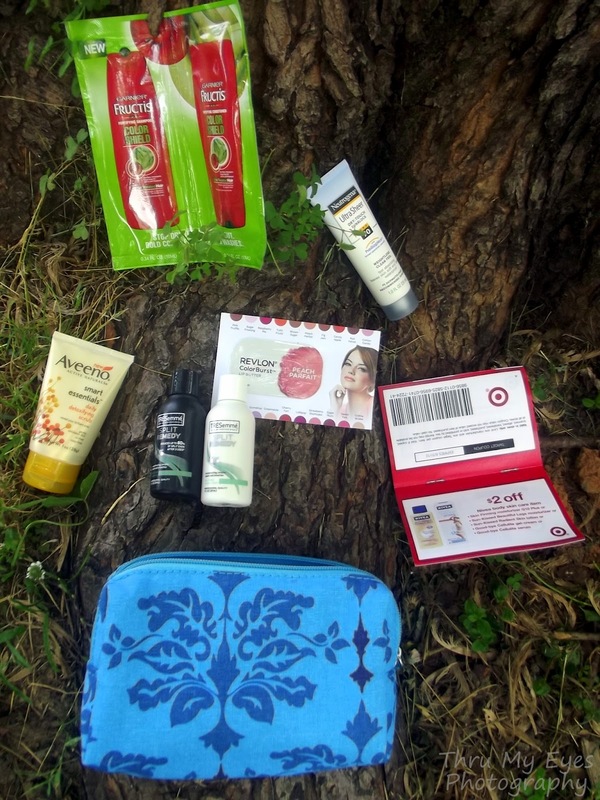 Target gives away some awesome freebies!! Earlier this week my daughters brought me a little box with the red and white target all over it. I got excited because I knew just what was inside it! My Target Summer Beauty bag!! When I opened the box I saw the most beautiful little blue make-up bag, filled with all kinds of goodies!! The Goodies Included : Aveeno Daily Detoxifying scrub, TRESemme Split Remedy Shampoo and TRESemme Split Remedy Conditioner, Neutrogena Ultra Sheer Dry-Touch SunBlock SPF 70, a small sample of Revlon Color Burst Lip Butter color Peach Parfait, and a Sample Packet of Garnier Fructis Color Shield Shampoo and Conditioner. Along with a Target coupon booklet for the items in the bag and more! This has to be the best freebie that I've gotten in a while!! I LOVE it! The make-up bag is a beautiful blue with a leaf style design in a darker blue! Prefect for travel or just for a sneak peek in some great products!! To start getting your own freebies in the mail Check out my Freebie Blog and start LOVEing the site of the Mail Lady! Freebies, Freebies, Freebies and Deals! I made my kids supper tonight! That may not seem like a big thing to mostly everyone but to me it is. I'm not a big cooker. My fiance does most of the cooking in my house. If he works nights.... then it's microwave food for me and my daughters! But tonight, Alan was at my cousins house getting his brakes changed so I decided to make my girls some food. It wasn't anything fancy but it was good and we loved it. What did I make?? Chicken and Mashed Potatoes! I boiled some chicken breasts a few days ago and kept some in the fridge. So I made the potato's and then broke the chicken in little strips and topped the mashed potato's with it. YUM!!!!! What a quick and yummy meal, my girls and I had. Now they are outside playing for a few more minutes before they get ready for bed. I have to say that I'm pretty proud of myself tonight!! Yay! Go me! Quick and Healthy Summer Snacks for Young Kids Cont. Press slices face down into 100's and 1000's. Slice into triangles or use cookie cutters. Bake rolls as per package directions. Split down the center. Place frankfurts into cold water and gently warm without bringing to the boil. Drain and place inside buns. Squeeze sauce over just before serving. I like to put a saucer in the pan to keep the frankfurts immersed because it is when they hit the cold air that they split. If you are going to the park for a picnic you can pour boiling water over the uncooked frankfurts in a thermos and let them sit while you re-boil the kettle. Then drain and cover with boiling water again and seal until you are ready to serve. I then place the split rolls in a plastic bag and heat them in the microwave for 1-2 minutes and then wrap the bag in tea towel to keep warm. When you get to the park you have warm rolls with hot frankfurts in the thermos and you can serve them up easily. Don’t forget the paper plates and napkins. This easy pizza-inspired roll-up is a kid-pleaser. Make crunchy vegetables more appealing by selecting colorful varieties like orange and purple cauliflower—and don't forget the dip! Keep 'em smiling with watermelon cut into fun shapes with cookie cutters. Along with a few cookies for desert! You can also do a Ham-and-Cheese Roll up by laying out one or 2 pieces of ham, add a slice of cheese on top of the ham. Then put one more slice of ham on top to hold the cheese in place. Then starting at one side, roll it up. You can serve these whole or cut them to make them more bite-size! Recipes found at www.kidszone.com , www.eatingwell.com and my kitchen! A quick, healthy snack for you kids! It's Summer time! What parent wants to slave over a stove in the middle of the day to make their children snacks thru-out the day, Or giving them those Rubbery microwaveable snacks? I was on a mission and searched the web to find some quick and healthy snacks for parents to give to their kids. Below are a few that I've found. I will be posting more soon! These tiny little beauties are so adorable and so yummy! They are also very easy to make! I'm sure they would be a hit, not only for a quick snack for you kids, but at Parties as well! Kids parties and Adult parties. The Popcorn cakes are very light and make perfect bottoms for the yummy toppings! 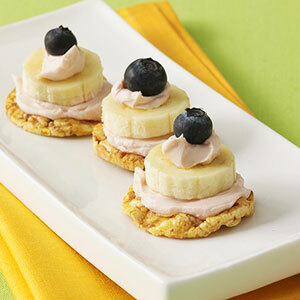 Spread cakes with cream cheese and top with banana slices. If desired, dollop with additional cream cheese and top with a blueberry. Serves 2. Toast waffles and cut into 6 sticks. Spread each stick with cream cheese and use a spoon or squeeze bottle to dot sticks with jelly. Serves 2. Spread crepes with peanut butter and sprinkle with strawberries. Roll up crepes, trim off ends, and cut log into 1-inch slices. Serves 2. Much like an arts and crafts project, making a snack can become an after-school activity. The bonus: Kids get to eat their artwork, and you get to sneak nutritious foods into their diet. •The Decorations Seeds, nuts, grapes, raisins, olives, frozen peas or beans. Lay out the materials and give each child plastic utensils and a plate "canvas." Suggest that they build sharks, monsters, cars, flowers, or have them write their names. TIP: This makes a great birthday party activity. DirectionsSpear about four pieces of fruit onto each pretzel, as if making a kebab, to create the worms. Leave a tip at the end for the tail. Parents, you can "pre-spear" the fruit if need be. Join 2 worms with a piece of fruit to make a longer creepy-crawler. Use sprinkles to make the eyes, spots and/or tiny feet. Enjoy Some Lunch Time Puzzle Fun! Start by making a sandwich with ham and cheese (or other sandwich meat). Separate the shapes & mix them up on your child's lunch plate. Have her rebuild the sandwich by putting the puzzle back together before she eats it. Having a Summer Birthday Party soon? Need some ideas for games that are cheep but the kids will still love? Here are 2 Balloon Pop Games, the top game is for school age kids and the 2nd game is for the smaller kids. What You Need : LOTS of Balloons!!!! 3. When the adult says Go, the players press together, trying to pop their balloon. The first team to pop their balloon wins. Or if you don't want a winner, you can keep going until all the balloons are gone. Tie other side of the string to the child's ankles, one on each leg. Have them run once down to the "finish line"
On their way back to the starting line, The kids have to pop each-others balloons. The last one with atleast one balloon not popped, Wins! Are you having a Summer Birthday Party Soon? 1 In blender, place all ingredients. Cover; blend on medium-high speed about 1 minute or until smooth. 2 Divide mixture among 6 (5-oz) paper cups. Cover cups with foil; insert craft stick into center of each pop. (Or fill ice pop molds according to manufacturer’s directions.) Freeze about 6 hours or until frozen.